Many scholars today read the Song as a collection of secular love poems. But for most of its history, Jews and Christians have celebrated this wondrous poem as one of the Bible’s most intimate depictions of divine-human relationship: between God and Israel, or between Christ and the Church. 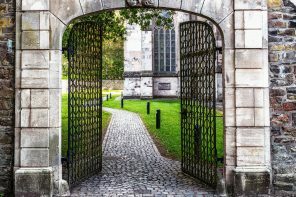 Sadly, it is neglected in many churches today. It only appears once in the three-year Sunday cycle of the Revised Common Lectionary. But those in the medieval church read it constantly, as evidenced by the quantity of Song commentaries they produced. The Saint John’s Bible aims to recapture this long tradition of exegesis, much of it rooted in the medieval monastic heritage of the Benedictine monks of Saint John’s Abbey. The Song of Solomon is the most heavily illuminated book in The Saint John’s Bible. 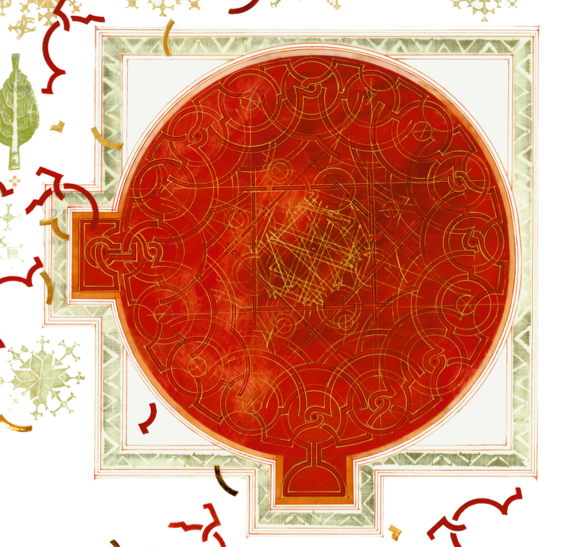 Every page of this biblical celebration of love is suffused with color and symbol. Here, we focus on one motif: the vibrant red circle inside a square boundary—the garden with its fertile pomegranate. 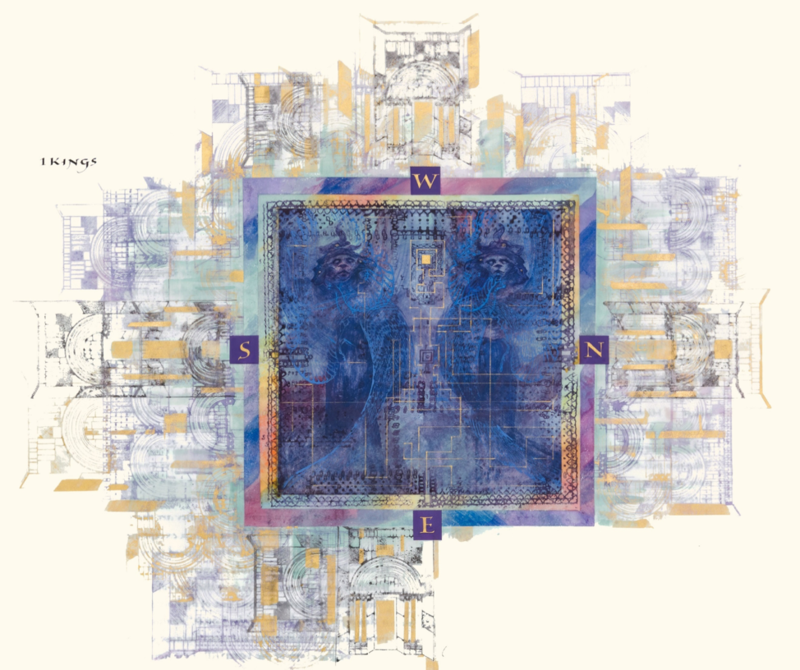 This square Garden, the sacred space of the Song, alludes to the most holy sacred space in ancient Israel: the Temple. In the symbolic language of The Saint John’s Bible, squares are frequently Temple imagery, such as in Solomon’s Temple (1 Kings 8:1-66). The geometric patterns of the garden also spur the viewer-reader into a deeper, slower spiritual engagement with Scripture. As the viewer’s eye traces the intricate geometric patterns around the pages and into and out of the garden, these patterns encourage a meditative state, an experience of flow. The geometric patterns, which begin on the first page, vary in their own absence and presence. Some are hollow and light, others are dark and filled in; some are far from the garden, some close. Some smaller flecks are in gold, hinting at the full divine presence to come. They lead into the red, circular garden, which completes the motif. But even within the garden itself, the pattern is incomplete: the full presence of God remains inarticulable in any medium. 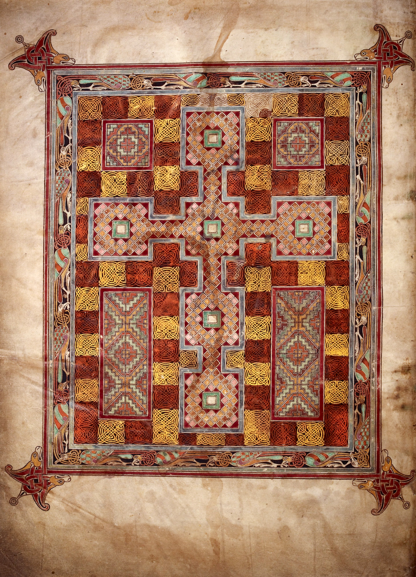 Folio 2v, carpet page, Lindisfarne Gospels, c. 700–720, Lindisfarne, Northumbria. Cotton Nero D. IV. As the viewer’s eye follows these geometric patterns around the page, as her mind fills in the patterns of the garden, she slowly ponders the full divine presence of the page and in the text. The cross, made up of many smaller patterns, becomes the full pattern of creation, imprinted in the viewer’s mind. This prayerful absorption guides us back into the words of Scripture inside the marginal illumination. We now read the Song of Solomon slowly, pondering its nuances, in the monastic lectio divina which The Saint John’s Bible celebrates and Benedictines practice. Reading is no longer consumption, a task to be completed. It has become contemplation, a garden to which we can continually return and pluck exegetical and spiritual fruit. J. Cheryl Exum, Song of Songs, Old Testament Library (Louisville: Westminster John Knox Press, 2005), 6. E. Ann Matter,The Voice of My Beloved: The Song of Songs in Western Medieval Christianity (Philadelphia: University of Pennsylvania Press, 1992). 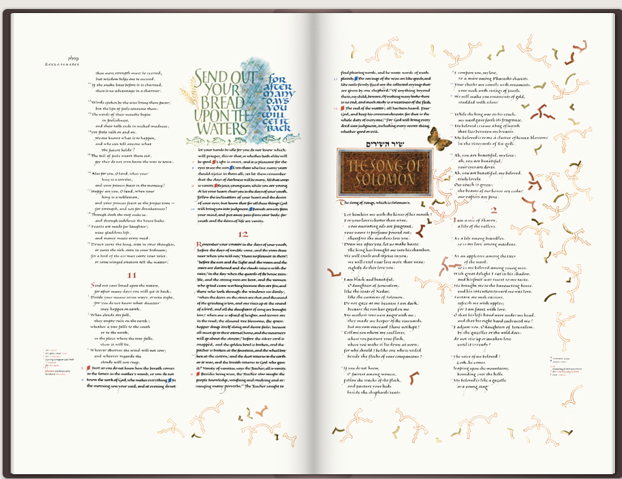 Christopher Calderhead, Illuminating the Word: The Making of The Saint John’s Bible, 2nd ed. (Collegeville, MN: Liturgical Press, 2015), 234. Jonathan Homrighausen, Illuminating Justice: The Ethical Imagination of The Saint John’s Bible (Collegeville, MN: Liturgical Press, 2018), 10–13. See Edmée Kingsmill, The Song of Songs and the Eros of God: A Study in Biblical Intertextuality, Oxford Theological Monographs (Oxford: Oxford University Press, 2009), chap. 5, ‘The Garden Temple’. Benjamin C. Tilghman, ‘Pattern, Process, and the Creation of Meaning in the Lindisfarne Gospels’, West 86th: A Journal of Decorative Arts, Design History, and Material Culture 24, no. 1 (2017): 3–28, https://doi.org/10.1086/693796. Image taken from British Library, https://www.bl.uk/collection-items/lindisfarne-gospels. 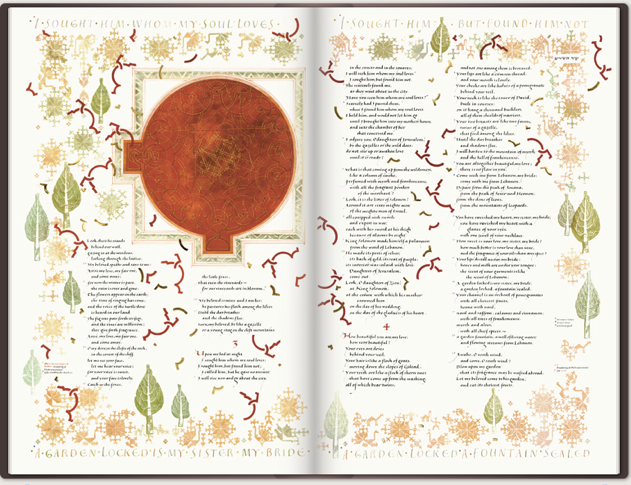 See Matthew A. Rothaus Moser, ‘Should Bibles Be Beautiful? How Beauty Teaches Us to Pray’, in The Saint John’s Bible and Its Tradition: Illuminating Beauty in the Twenty-First Century, ed. Jack R. Baker, Jeffrey Bilbro, and Daniel Train (Eugene, OR: Pickwick Publications, 2018), 43–58. The artwork in the St. John’s Bible (what I’ve seen of it here) and your refections upon it are delicious. Thank you. 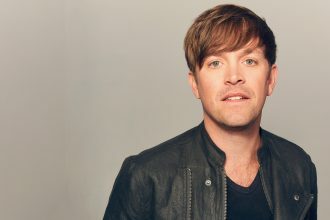 Have you encountered Calvin Seerveld’s work on the Song (The Greatest Song: In Critique of Solomon, Toronto Tuppence Press)? I am not a fan of medieval allegory and symbology, so Seerveld’s casting of the Song as an historical/prophetic drama (he even provides music toward an oratorio performance!) feels far truer to me, especially his portrayal of Solomon as the degenerate King bent on adding the Shulammite to his long list of sexual conquests. In any case, thank you for whetting my appetite for exploring the St. John’s Bible, its artwork in particular.